The International Finance Corporation, a private lending arm of the World Bank Group, may blacklist a number of Korean construction companies for fixing prices in bids for pork-barrel projects after reviewing builders defenses. “The IFC has asked the Korean builders to offer explanations on the recent announcement by the Korean government that they were found guilty of collusion,” said an official at the Construction Association of Korea. The IFC is one of the largest funding sources for major Korean builders, meaning unfavorable relations with it could thwart the companies’ future bids in global overseas projects, and even lead to suspensions of ongoing projects, the official said. One of the Korean builders in question was asked to submit materials related to the allegations by an international firm that had placed an order for a terminal project in Oslo. After appealing to the local government’s decision, the firms could be banned from government commission projects for up to two years if they lose the lawsuits. Last week, the Fair Trade Commission said it slapped fines worth some 435.5 billion won ($423.9 million) on 28 Korean construction firms for colluding to secure orders for a public high-speed railway construction project. 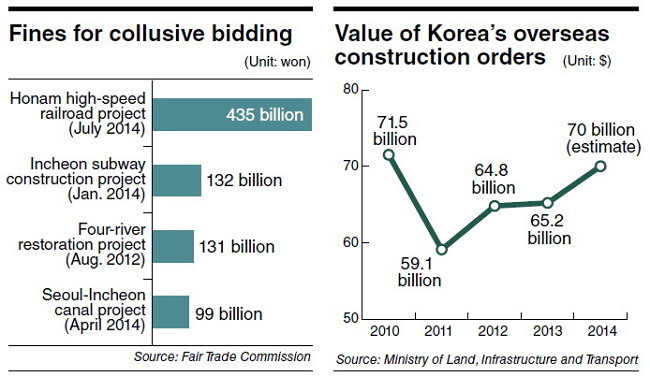 This year alone, collusion penalties imposed on the construction sector amounted to more than 700 billion won. “Chronic price-fixing was detected in these large-scale state businesses. The FTC will continue to place the sector under close scrutiny to root out such illegal practices,” the FTC said in a statement. The culprits, according to the FTC findings, included all the top players ― Hyundai Engineering & Construction, Daewoo E&C, SK E&C, GS E&C, Samsung C&T, Daelim E&C and Hyundai Industrial Development and Construction. The construction sector, however, claims that the projects were devised in such ways that companies could not make a profit unless they rigged the bids. Builders also are requesting a reduction of the fines. Industry experts predicted such exposure of illegal practices could damage the reputation of local construction firms, causing them to lose global contracts. Critics said the fines would do no good since the builders would have profit left over even after paying up, which is why price-rigging is still rampant in the industry. In many cases, the fines are dramatically reduced following lawsuits filed by the firms. In the first half of this year, overseas construction orders procured by South Korean builders reached $37.5 billion to reflect a 21.5 percent increase from the same period a year ago, contributing to increased net earnings for the sector.